***In the interest of safety, the April 30th, 2017 St. Louis, MO area Import Face-Off event has officially been canceled in advance due to the inclement weather forecast of 90 - 100% chance of rain throughout the entire day. Forecasters are also announcing that there are risks of major flooding for the weekend. Those who purchased tickets in advance will be fully refunded through credit card within 48 hrs. The next area St. Louis IFO at Gateway Motorsports Park will be on September 17th. 4/30/17. Car show registration from 9am to 12pm (absolute latest 3pm), judging begins at 10, awards ceremony around 5. Drag race roll-in starts at 8:00am, heads up drag race qualifying (2 rounds) start at 11, drag race eliminations around 2. Event ends around 6pm. 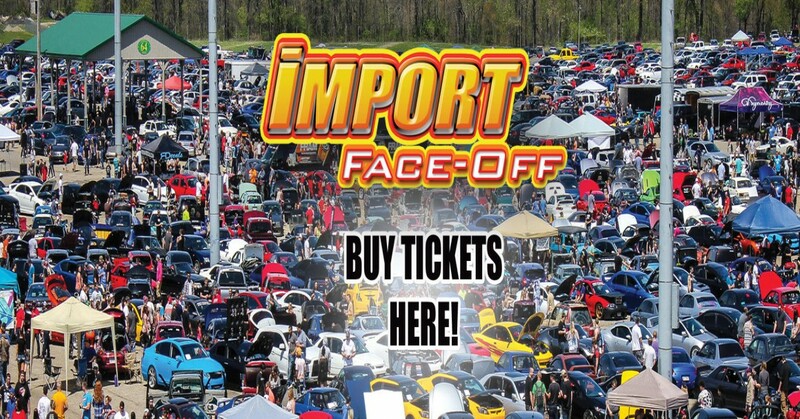 Car/truck/bike show, 1/4 mile drag racing, Usaci single points stereo crank it up contest, open drifting hosted by DriftSTL.com, burnout contest (time permitting), vendors, pit midway, live Sport Compact Fighting (Midget Wrestling)! *Typical savings is 12% off of the best corporate rate.